We are made of elegant, interacting, dynamic structures called cells. The best estimate is that there are around 32 trillion cells in the human body. Today 5th graders begin to learn about cells and cell biology. But for the rest of us, who may be a bit rusty, or who aren’t as caught up with all the advances that have occurred in understanding cells in the last 30 years or so, this is where we have to start to understand oncology in 2016. Let’s look at what you may know. 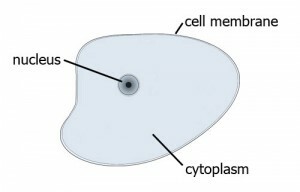 Cells are made of cell membranes, a nuclei (containing DNA) and cytoplasm (the stuff that is inside the cell membrane). Those are basics. cells have been scrutinized: the cell membrane has been analyzed so we know what molecules form it. Exploring the cytoplasm, we find that it isn’t just an empty, jello-like substance. It’s jam packed with specialized organelles, proteins, amino acids (the building blocks of proteins), RNA (a type of nucleic acid that is related to DNA), a cytoskeleton (made of microtubules) and more. The nucleus itself contains DNA, RNA, proteins and more. With the electron microscope we now have a clearer picture of what a cell looks like inside–the organization of cells. Inside the cell many activities take place. Cells take in nutrients through their cell membranes and expel waste the same way. 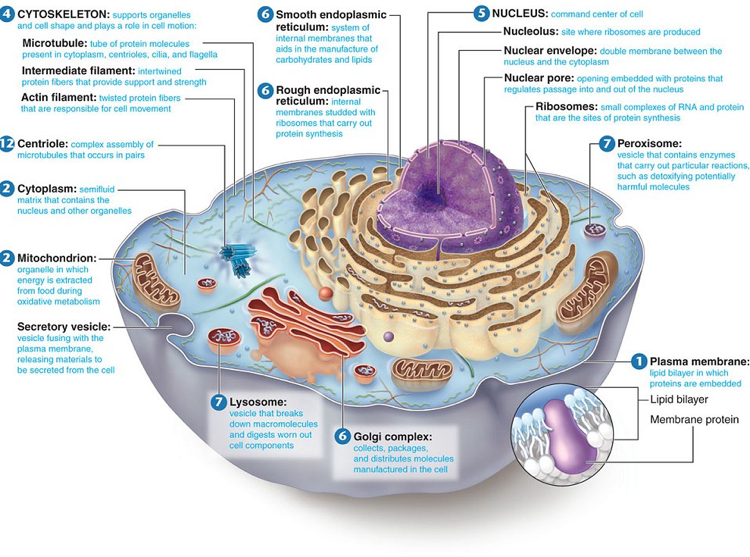 Mitochondria inside the cell break down carbohydrates and fatty acids to generate energy. Ribosomes build proteins. Golgi bodies transform and package proteins. This animation gives you a glimpse at what these organelles do. Cells communicate with each other via molecules…these molecules tell (“signal”) cells to create proteins. The creation of proteins requires many steps. Scientists have discovered the components of these steps. These step-by-step processes are called “Pathways.” The molecules of these Pathways have long names so scientists use acronyms. Here’s an example of a pathway written in acronyms. In this pathway, a chemical signal (Growth Factor) arrives at the surface of the cell membrane. Sticking out of the cell membrane are receptors (large molecules) like TKR (tyrosine kinase receptors) that stick into the cell cytoplasm. The chemical signal connects to one of the receptor molecules and binds to it–fitting together like a puzzle piece or a key fitting into a lock. Their binding together changes the shape of the receptor molecule which starts activity in the cytoplasm–cascading signals. This pathway (shown above) is called mitogen-activated protein kinase or MAPK signaling pathway. 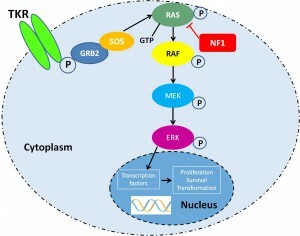 This pathway includes the signaling molecules RAS, RAF, MEK and ERK. ERK with a phosphate (p) enters the nucleus. Below is a video explains the cascading signaling when a cell receptor encounters insulin. 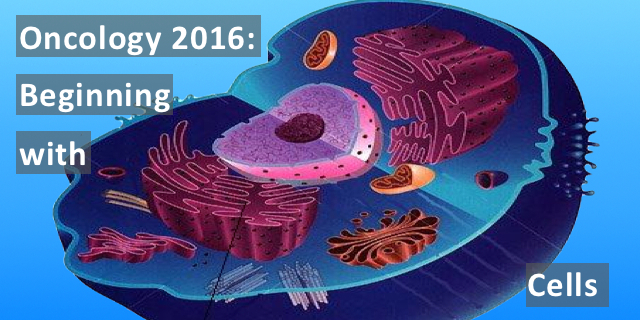 These cell basics are just the beginning to understanding what is new in oncology. The next post will be about DNA changes and interventions/treatments that are part of today’s oncology arsenal.